This mod lets you take control of the chat channels your server offers, by showing them which one is active, and allowing you to switch channels even while typing in chat. Here, whatever I type gets sent to LukeLantern. Of course I know this as I've just been chatting with him, but often enough, after a conversation, I forget I'm still in that channel, and when I want to write something in community chat a while later, it gets sent to Luke anyway. This UI reminds me I'm still talking to Luke, and lets me just press the Community button to redirect what I'm saying. Your server may offer different channels (this example is from play.emc.gs), so you can configure which channels you have, how to detect channel switches, and which commands to use to switch channels. Please note: this mod does *not* add chat channels to your multiplayer world. It's intended to improve your control over existing channels your server gives to you. 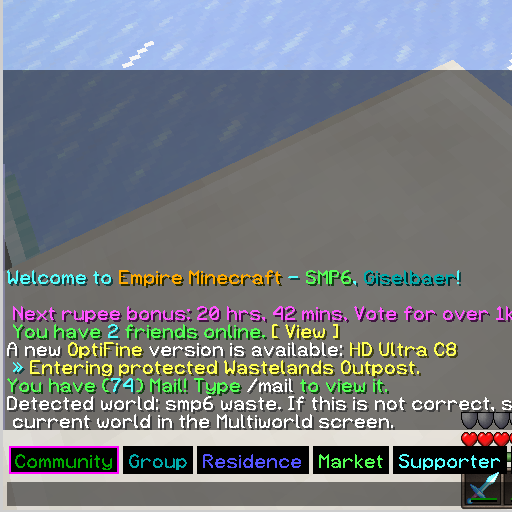 If you're playing on Empire Minecraft (emc.gs), the mod will work for you right out of the box. If you're playing somewhere else where chat commands and responses are different, you'll need to change the configuration to match your server. For each chat channel, you need to know the command to enter it, and the message the server sends you when you enter. the string the server sends back when you enter that channel. No formatting codes here, even if the server sends them! You can omit the second column if there's no specific command to enter that channel, but that means you won't have the clickable button. If you have message channels to PM to people (not using /msg or /r, instead, temporarily sending all chat to someone), you can include their name in the channel name. For example, EMC sends "Started private conversation with DavisAtDavis" when I enter a conversation with him. To grab his name, I use "Started private conversation with (. *)" in the third column, and add a fourth one that has just the text string "usetext" in it. This will grab the name from the server message, and append it to the channel name. §2Global;/ch global;\[uChat\] Now you are in the channel Global. §eLocal;/ch local;\[uChat\] Now you are in the channel Local. §bAdmin;/ch admin;\[uChat\] Now you are in the channel Admin. §3Discord;/ch discord;\[uChat\] Now you are in the channel Discord. The default message includes a [uchat] at the beginning of the line, and because [ and ] are special characters, they need to be escaped with a backslash (\). The color codes at the start of each line are optional but make the UI look better, and correspond to the chat channel's colors. How do I change the color of the chat channel name? Put the matching minecraft color selector, like §a or §5, in front of the channel name in chatcontrol-channels.txt. How do I find those color selectors? Soo... This is like a non-Liteloader TabbyChat? No. Tabbychat sorts incoming chat messages into mutliple tabs depending on chat content. This mod is for people who play on a server that has multiple chat channels (for example, HeroChat is a server plugin which does that), and who want to see which server chat channel they're in to prevent talking in the wrong channel. I have tried to insert the channel code in the description both inside and outside of the curly braces. You nailed it, glad you got this sorted out. The chatcontrol.cfg file has the stuff you can change from the forge ingame config menu. chatcontrol-channels.txt has the channel definitions. does not have some mod that on the part of the server, serve to manage the channels, without having to add a plugin? Sorry, but I don't understand the question. If the server doesn't offer multiple chat channels, then no client-side mod can implement them. You need a plugin on the server like herochat or ultimate chat or mcmmo partychat or similar to have chat channels at all. IF the server has chat channels, THEN the mod can detect which one you're in by looking at the channel-switch-messages it gets from the server, and show you the one you're using and send commands to the server to switch when you press the buttons. that's why I'm asking you! would not have some mod that you know that makes these channels without having the need of a sponge plugin for example! or would you like to make a simple mod that makes these channels? Unfortunately I do not speak English natively, so the translation may go a little wrong or confused. You can't make channels without server support, because you can't tell other people which chat is intended where without involving the server. However, check out TabbyChat (https://minecraft.curseforge.com/projects/tabbychat-2), maybe that'll help you a bit.